In terms of mechanics, we used smoothed historical growth rates in earnings and dividends as our projected growth rates and a two-stage dividend discount model. Looking at these numbers, we would draw the following conclusions. • The implied equity premium has seldom been as high as the historical risk premium. Even in 1978, when the implied equity premium peaked, the estimate of 6.50% is well below what many practitioners use as the risk premium in their risk and return models. In fact, the average implied equity risk premium has been between about 4% over the last 40 years. • The implied equity premium did increase during the seventies, as inflation increased. This does have interesting implications for risk premium estimation. Instead of assuming that the risk premium is a constant and unaffected by the level of inflation and interest rates, which is what we do with historical risk premiums, it may be more realistic to increase the risk premium as expected inflation and interest rates increase. histimpl.xls: This data set on the web shows the inputs used to calculate the premium in each year for the U.S. market. ^ implprem.xls: This spreadsheet allows you to estimate the implied equity premium in a market. The final set of inputs we need to put risk and return models into practice are the risk parameters for individual assets and projects. In the CAPM, the beta of the asset has to be estimated relative to the market portfolio. In the APM and Multi-factor model, the betas of the asset relative to each factor have to be measured. 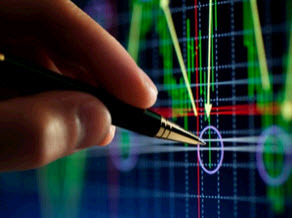 There are three approaches available for estimating these parameters; one is to use historical data on market prices for individual assets; the second is to estimate the betas from fundamentals and the third is to use accounting data. We will use all three approaches in this section. This is the conventional approach for estimating betas used by most services and analysts. For firms that have been publicly traded for a length of time, it is relatively straightforward to estimate returns that a investor would have made on the assets in intervals (such as a week or a month) over that period. These returns can then be related to a proxy for the market portfolio to get a beta in the capital asset pricing model, or to multiple macro economic factors to get betas in the multi factor models, or put through a factor analysis to yield betas for the arbitrage pricing model. The standard procedure for estimating betas is to regress21 stock returns (Rj) against market returns (Rm) -Rj = a + b Rm where a = Intercept from the regression b = Slope of the regression = Covariance (Rj, Rm) / a2m The slope of the regression corresponds to the beta of the stock and measures the riskiness of the stock. Jensen's Alpha: This is the difference between the actual returns on an asset and the return you would have expected it to make during a past period, given what the market did, and the asset's beta. Thus, a comparison of the intercept (a) to Rf (1-p) should provide a measure of the stock's performance, at least relative to the capital asset pricing model.22 If a > Rf (1-p) Stock did better than expected during regression period a = Rf (1-p) Stock did as well as expected during regression period a < Rf (1-p) Stock did worse than expected during regression period The difference between a and Rf (1-p) is called Jensen's alpha, and provides a measure of whether the asset in question under or out performed the market, after adjusting for risk, during the period of the regression. 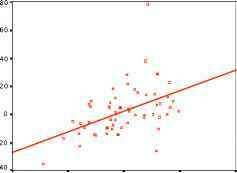 The third statistic that emerges from the regression is the R squared (R2) of the regression. R Squared: The R squared measures the proportion of the variability of a dependent variable that is explained by an independent variable or variables. 21 The appendix to this chapter provides a brief overview of ordinary least squares regressions. 22 The regression can be run using returns in excess of the risk-free rate, for both the stock and the market. In that case, the intercept of the regression should be zero if the actual returns equal the expected returns from the CAPM, greater than zero if the stock does better than expected and less than zero if it does worse than expected. While the statistical explanation of the R squared is that it provides a measure of the goodness of fit of the regression, the financial rationale for the R squared is that it provides an estimate of the proportion of the risk (variance) of a firm that can be attributed to market risk; the balance (1 - R2) can then be attributed to firm-specific risk. The final statistic worth noting is the standard error of the beta estimate. The slope of the regression, like any statistical estimate, is made with noise, and the standard error reveals just how noisy the estimate is. The standard error can also be used to arrive at confidence intervals for the "true" beta value from the slope estimate. 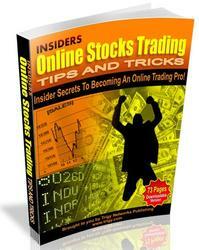 There are three decisions the analyst must make in setting up the regression described above. The first concerns the length of the estimation period. The trade-off is simple: A longer estimation period provides more data, but the firm itself might have changed in its risk characteristics over the time period. Disney and Deutsche Bank have changed substantially in terms of both business mix and financial leverage over the last few years and any regression that we run using historical data will be affected by these changes. 23 The non-trading bias arises because the returns in non-trading periods is zero (even though the market may have moved up or down significantly in those periods). Using these non-trading period returns in the regression will reduce the correlation between stock returns and market returns and the beta of the stock. 24 The bias can also be reduced using statistical techniques suggested by Dimson and Scholes-Williams. relative to the FTSE, Japanese stocks relative to the Nikkei, and U.S. stocks relative to the S&P 500. While this practice may yield an estimate that is a reasonable measure of risk for the parochial investor, it may not be the best approach for an international or cross-border investor, who would be better served with a beta estimated relative to an international index. 25 The ex-dividend day is the day by which the stock has to be bought for an investor to be entitled to the dividends on the stock. Returnintel, j =( Factorj * PriceIntel, j - PriceIntel, J-1+ Factor * Dividends^ / PriceIntelj-1 The factor would be set to 3 for July 1998 and the ending price would be multiplied by 3, as would the dividends per share, if they were paid after the split. where IndeXj is the level of the index at the end of month j and Dividendj is the dividends paid on the index in month j. While the S&P 500 and the NYSE Composite are the most widely used indices for U.S. stocks, they are, at best, imperfect proxies for the market portfolio in the CAPM, which is supposed to include all assets. Figure 4.3 graphs monthly returns on Disney against returns on the S&P 500 index from January 1999 to December 2003. (a) Slope of the regression = 1.01. 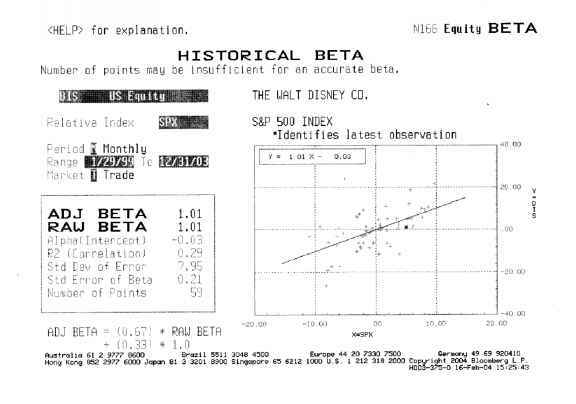 This is Disney's beta, based on returns from 1999 to 2003. Using a different time period for the regression or different return intervals (weekly or daily) for the same period can result in a different beta. 28 The regression statistics are computed in the conventional way. The appendix explains the process in more detail. 29 In practice, the intercept of the regression is often called the alpha and compared to zero. Thus, a positive intercept is viewed as a sign that the stock did better than expected and a negative intercept as a sign that the stock did worse than expected. In truth, this can be done only if the regression is run in terms of excess returns, i.e., returns over and above the riskfree rate in each month for both the stock and the market index. (c) R squared of the regression = 29%. This statistic suggests that 29% of the risk (variance) in Disney comes from market sources (interest rate risk, inflation risk etc. ), and that the balance of 71% of the risk comes from firm-specific components. The latter risk should be diversifiable, and therefore unrewarded. Disney's R squared is slightly higher than the median R squared of companies listed on the New York Stock Exchange, which was approximately 21% in 2003. (d) Standard Error of Beta Estimate = 0.20. This statistic implies that the true beta for Disney could range from 0.81 to 1.21 (subtracting adding one standard error to beta estimate of 1.01) with 67% confidence and from 0.61 to 1.41 (subtracting adding two standard error to beta estimate of 1.01) with 95% confidence. While these ranges may seem large, they are not unusual for most U.S. companies. This suggests that we should consider regression estimates of betas from regressions with caution. Assume that, having done the regression analysis, both Disney and Amgen, a biotechnology company, have betas of 1.01. Disney, however, has an R-squared of 31%, while Amgen has an R-squared of only 15%. If you had to pick between these investments, which one would you choose? Would your answer be any different if you were running a well-diversified fund? Adjusted Beta = Raw Beta (0.67) + 1 (0.33) These weights do not vary across stocks, and this process pushes all estimated betas towards one. Most services employ similar procedures to adjust betas towards one. In doing so, they are drawing on empirical evidence that suggests that the betas for most companies, over time, tend to move towards the average beta, which is one. This may be explained by the fact that firms get more diversified in their product mix and client base as they get larger. 30 This is why the intercept in the Bloomberg print out (0.03%) is slightly different from the intercept estimated earlier in the chapter (0.05%). The beta and R-squared are identical. In general, betas reported by different services for the same firm can be very different because they use different time periods (some use 2 years and others 5 years), different return intervals (daily, weekly or monthly), different market indices and different post-regression estimates. While these beta differences may be troubling, the beta estimates delivered by each of these services comes with a standard error, and it is very likely that all of the betas reported for a firm fall within the range of the standard errors from the regressions. What was the dividend for disney stock in 1978?